Operator console of the CDC 6400 with four magnetic tape memory units in the background with a magnetic tape controller unit in front of them at the Rechenzentrum (Computer Center) of RWTH Aachen University, Germany (1970). The CDC 6400, a member of the CDC 6000 series, was a mainframe computer made by Control Data Corporation in the 1960s. The central processing unit was architecturally compatible with the CDC 6600. But in contrast to the 6600, which had 10 parallel functional units which could work on multiple instructions at the same time, the 6400 had a unified arithmetic unit, which could only work on a single instruction at a time. This resulted in a slower, lower-performance CPU, but one that cost significantly less. Memory, peripheral processor-based input/output (I/O), and peripherals were otherwise identical to the 6600. 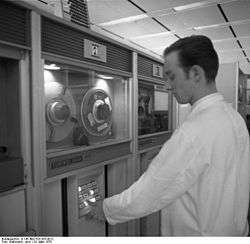 In 1966, the Computing Center (German: RechenZentrum) of the RWTH Aachen University acquired a CDC 6400, the first Control Data supercomputer in Germany and the second one in Europe after the European Organization for Nuclear Research (CERN). It served the entire university also by 64 remote-line teletypes (TTY) until it was replaced by a CDC Cyber 175 computer in 1976. The CDC 6500 was a dual CPU 6400. The CDC 6700 was also a dual CPU machine, but had one 6600 CPU and one 6400 CPU. The CDC 6415 was an even cheaper and slower machine; it had a 6400 CPU but with only seven PPUs instead of the normal ten. ↑ "Chronik des heutigen Rechen- und Kommunikationszentrums (RZ) der RWTH Aachen" (in German). ReZe RWTH Aachen. Retrieved 2013-12-13.